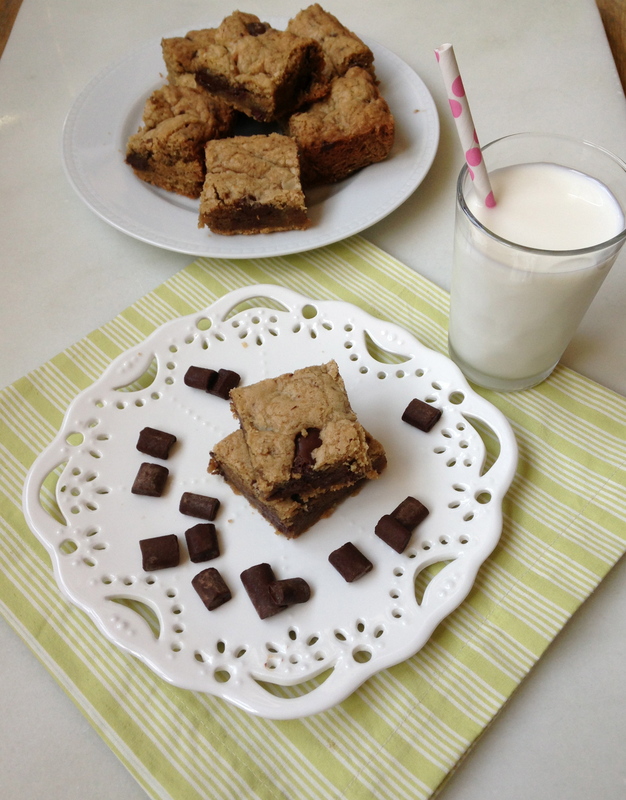 How have I never made cookie bars before? That is really a great question, because these were SO easy and SO good. I was sitting on the couch the other night, craving something sweet (by the other night I mean every night…) and decided I wanted to whip up something quickly. No chilling of the dough or softening of the butter or getting out the heavy stand mixer (I love my mixer, but it is so darn heavy, and there is no room for it on our counter top!). And then I stumbled on this recipe from Averie Cooks and had to make them immediately. It is seriously so easy! Just mix together the ingredients, spread it into a baking pan, and bake for about 20 minutes. Voila! Chocolate peanut butter heaven. If you haven’t learned by now, chocolate and peanut butter is the dessert flavor of choice in our house (here, here, and here ). 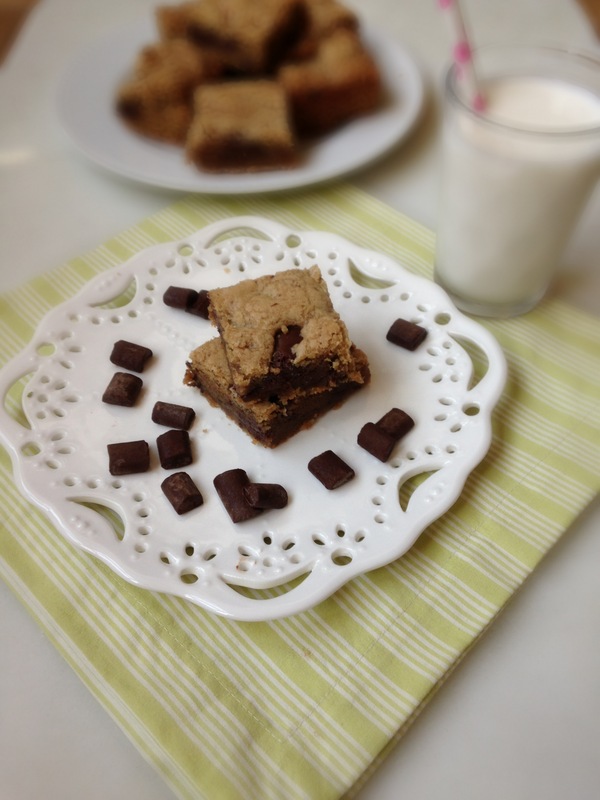 This recipe definitely satisfies the choco pb craving! The hardest part is letting them cool before you slice them. I obviously had to sample a little bit warm, and they really do get better as they cool. Once they are completely cool, the bars are still so soft and doughy in the centers, and chewy on the edges. 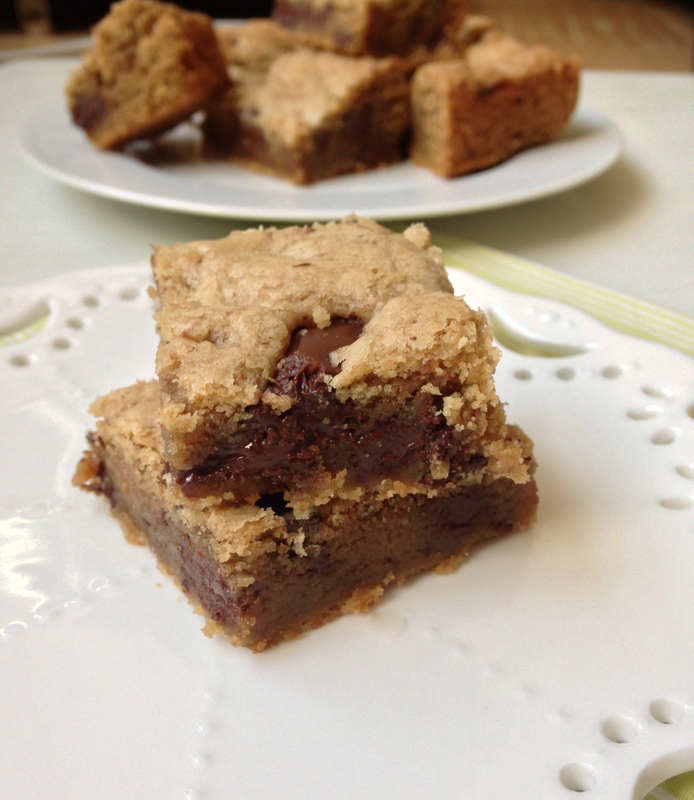 The chocolate is rich and delicious, and of course the peanut butter ties everything together! 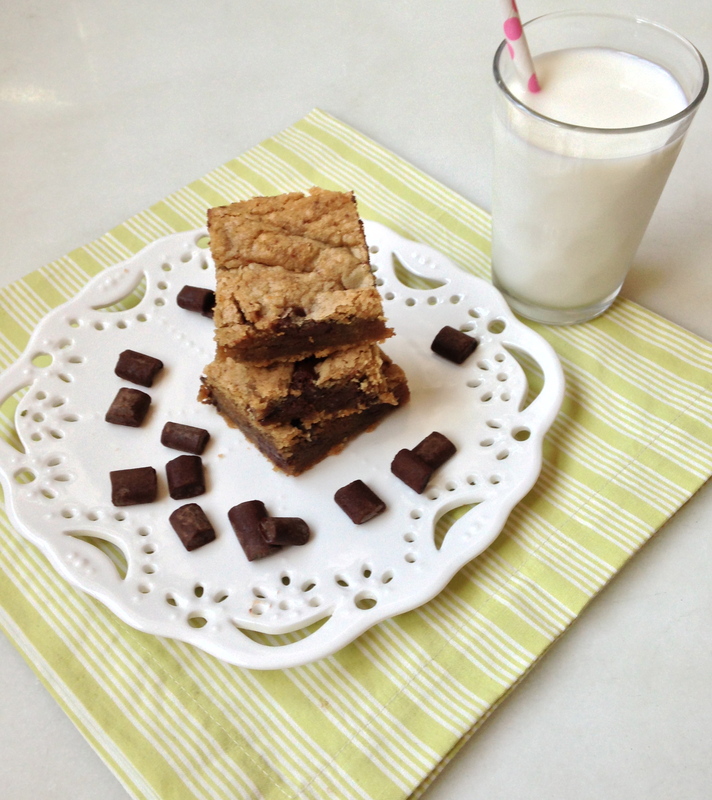 This is a great recipe for a quick, easy and delicious treat. Look at how soft and gooey the bars are! These beg for a glass of milk! So easy to whip up! Enjoy! Preheat the oven to 350 degrees F. Line an 8×8 inch baking pan with aluminum foil and spray the foil with nonstick cooking spray. Melt the butter in a large microwave-safe bowl. This will take about one minute in the microwave. Let the butter cool slightly so that the egg doesn’t scramble. Add the egg, sugars, and vanilla and whisk to combine, about one minute. Whisk in the peanut butter. Add the flour, baking soda, and salt, and stir until the dry ingredients are just incorporated. Mix in the chocolate. Spoon the batter into the prepared pan, pressing it into the pan evenly with a spatula. Bake for 18 – 22 minutes, until the center is just set. The bars will firm up as they cool, so do not overbake them! Thanks for trying my recipe! Glad you enjoyed them and gosh, I would really love one of your bars right about now! Thanks, Averie! Another great recipe, thank you for sharing!! I love Averie’s recipes! She always has the best ideas. I know, her recipes are delicious! 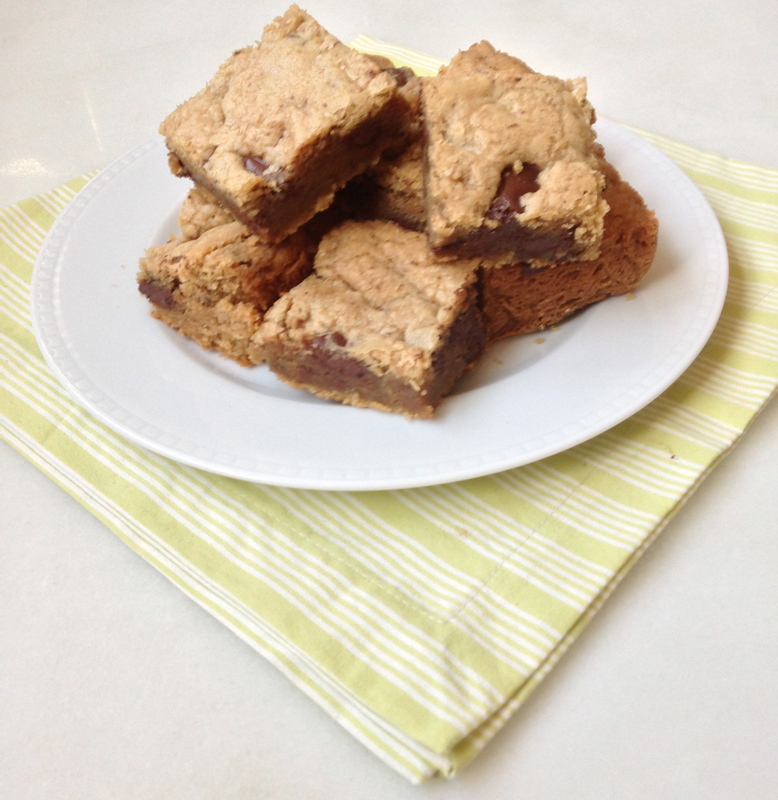 i make cookie bars for those exact reasons! they are SO easy. this looks like a winner! I will definitely be making a lot more cookie bars. Too easy, it is dangerous!! What a perfect and easy snack for any evening. Who doesn’t love chocolate and peanut butter?! Chocolate and peanut butter is the best combo! LOVE the big chocolate chunks in these!